The Paris Conference is seeing a succession of leaders stating claims to territories they want for their countries. Czechoslovakia‘s delegates make their case today. The Allies are well-disposed towards the Czechoslovaks, noting the role of the Czechoslovak Legion in combatting Russian Bolshevism. They also appreciate that, unlike the Poles, the Czechoslovaks are careful not to make outlandish claims. Beneš, their delegation’s leaders, does float the idea of territory being transferred to Czechoslovakia from Germany and for a corridor between Hungary and Austria to Yugoslavia (another new Slavic nation), but he makes clear privately that these are just suggestions floated to appease his more nationalist colleagues. The Czechoslovaks also argue for their country to be extended eastwards to include territories inhabited by Ruthenes, a kindred people. The Czechoslovaks are fortunate in that the border conflict with Poland over the town of Teschen has now wound down, with Czechoslovak forces having the advantage. In broad terms the Czechoslovak borders are now relatively set, with the Paris Conference only needing to rubber-stamp convenient facts on the ground. 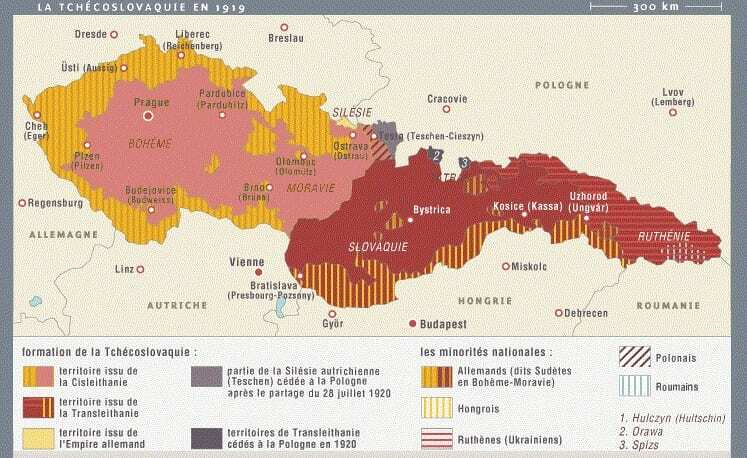 However, the intermingling of peoples in Central Europe means that Czechoslovakia contains large minorities of people who would rather not be a part of it: Germans in Bohemia and Moravia and Hungarians in the Slovak areas. Relations with these minorities may prove troublesome, as may relations with Germany and Hungary themselves. Czechoslovakia’s future may also turn problematic if the bonds of fellowship break down before the more urban and industrial Czechs and their rural and agricultural Slovak compatriots.